With the reboots of She-Ra: Princess of Power and Thundercats Roar, strong feelings of nostalgia have been brought to the surface for a lot of ’80s cartoon fans. For many, this was a sacred time in their lives, a time when weekday afternoons and Saturday mornings were held in the same regard as those who attend religious services. The stories witnessed on these shows helped shape so many young minds and are still honored and respected decades later. Crank up some Stan Bush as we look at the greatest cartoons from the ’80s, an era many people still hold ridiculously dear to this day. This show deals with the adventures of Scrooge McDuck and his grand-nephews Huey, Dewey, and Louie, who are on a quest for treasures and adventure of all kinds. Think Indiana Jones, but with ducks. This show had quite the budget for an animated show at the time and that’s evident in the animation quality. Disney fast-tracked the show for daily syndication, which led to its overwhelming popularity. It spawned a full-length animated feature (DuckTales: The Movie: Treasure of the Lost Lamp,) a very fun Nintendo game, and a series reboot in 2017 with a new voice cast. But the original had the talent of Alan Young, Russi Taylor, Chuck McCann, Terence McGovern, and Frank Welker (a name you’ll see often on this list). It also boasts the catchiest theme song since Denver, the Last Dinosaur. One of those themes is stuck in your head now, isn’t it? A highly-trained elite strike force comprised of the best of each branch of the military fights against the ruthless terrorist organization COBRA. Like many other cartoons of the time G.I. Joe was all about the action but with enough moral decision-making to be a decent program. Everybody remembers those PSAs at the end of each episode. But this one was always about the toys. The first series was produced by Hasbro and Marvel, and based on a successful line of 12-inch figurines. It has spawned six other series since the first, and many animated and live-action films. If your only introduction to the Joes has been with the live-action films, you should really go back and check out the original series. It has another great cast of voice actors including Michael Bell, Neil Ross, Frank Welker, and Christopher Collins. Prince Adam of the planet Eternia becomes the mighty He-Man to protect Castle Grayskull from the forces of the evil Skeletor. This is still quite an amazing animated adventure series, at least as far as plots go. Contrary to popular belief, the original toy line was not supposed to be based on Conan the Barbarian and in fact Hasbro and the film’s creators went to court to settle the dispute. Hasbro won, obviously. Speaking of Conan, this was during a period of time in the ’80s where many entire plots seemed to be inspired by the art of Frank Frazetta. It should also be noted that production house Filmation was one of the few animation studios at the time to not outsource to another country. It also spawned the hit spin-off She-Ra: Princess of Power. In fact, “The Secret of the Sword” (the first five episodes of She-Ra) are worth a watch. He-Man was rebooted by Cartoon Network in 2002 with a two-season run and met with very positive reviews. Check out both original shows on Netflix right now. An alien ship crash-lands on an island in the South Pacific. After humans utilize the alien technology, an alien race descends to wage war against us. Robotech is one of the greatest anime series of all time, hands down, even if it technically didn’t exist. As many now know, this “series” was three unrelated Japanese anime shows edited together into one long epic story for North American audiences. For many, it was the first introduction to anime. As a child the animation was flawless, and as an adult it still holds up. It was also quite mature for a cartoon. Right from the beginning, the stakes are high and a whole lot of people die. This probably has the highest body count of any other cartoon at the time. The cast involved is an enormous “who’s who” of anime voice actors, too big to name. Also too big to name are the many continuations and spin-offs including comics, games, and an infamous animated feature produced by Cannon Films. If the first episode doesn’t hook you, you aren’t paying attention. Binge it now on Netflix. The Simpsons, the now famous Matt Groening show, started as a series of shorts on the sketch-driven The Tracey Ullman Show. James L. Brooks elongated it to half-an-hour, starting with a Christmas special that aired Dec. 17, 1989 and the rest is history. This show has gone on to become the longest running American animated program, longest running American sitcom, and longest running prime-time scripted television series. This year, in fact, will be the 30th season! This show invaded pop culture like a fast-moving virus into the ’90s. You couldn’t look both ways to cross the street without seeing Bart Simpson somewhere. Talk of a movie adaptation was inevitable. The feature-length spin-off came later, in 2007, many years after the initial “mania” to relatively positive reception. Who’s to say how long it will go on? Side note: If you’ve never read Matt Groening’s original Life in Hell comics, do so immediately. Teenage Mutant Ninja Turtles is the story of four anthropomorphic teenage turtles trained by their rat sensei in the art of ninjutsu. Created by Kevin Eastman and Peter Laird in comics by Mirage Studios, then created as a toy line for Playmates, the subsequent tie-in series became an instant success. The show was fun and exciting, with more emphasis on humor than the comics. Everyone had their favorite turtle. The toys were hot, the video games were fun, and the feature-length live action 1990 movie might be one of the finest comic book films ever made. There have been a few new iterations of the same story over the years with rebooted series and films. Each generation has their turtles, but the spirit (usually) remains the same. This show boasted some voice-over heavyweights like Rob Paulsen, Cam Clarke, Townsend Coleman, Barry Gordon, Pat Fraley, and the late great James Avery. In fact, Paulsen (original Raphael) is the new voice director for this year’s Rise of the Teenage Mutant Ninja Turtles. Look, there’s a reason those Micheal Bay movies keep coming out. Again based on a Hasbro toy line and produced by Marvel, Transformers was three seasons (and a movie) of giant robotic mayhem. The cast list for this one is too big to name, but special attention must always be given to Peter Cullen and Frank Welker as Optimus Prime and Megatron, respectively. Since it premiered, there’s pretty much been a Transformers series for every generation since and feature films that don’t appear to be stopping anytime soon. Not every iteration is loved by all, but the classic war between the Autobots and the Decepticons will probably keep going as long as it keeps making money and the toys keep selling. To be fair, the toys are really some of the coolest. Much like Robotech, Voltron was an American cartoon adapted from another Japanese anime, and introduced many a Western child to the style. During its initial run, it was the top-rated syndicated children’s show on television. Voltron, defender of the universe, was separated into five parts by the evil witch, Hagger. Each part is powered by an element of the planet Arus, but are lost and dormant until they are found by five space explorers. Can they resurrect the mighty robot? You’ll hear more classic voices in this one, including Peter Cullen, Neil Ross, Michael Bell, and B.J. Ward. Like many entries on this list, this show has had many spin-offs, continuations, and a successful Netflix reboot in 2016, introducing this classic story to a whole new generation. Watch it today. 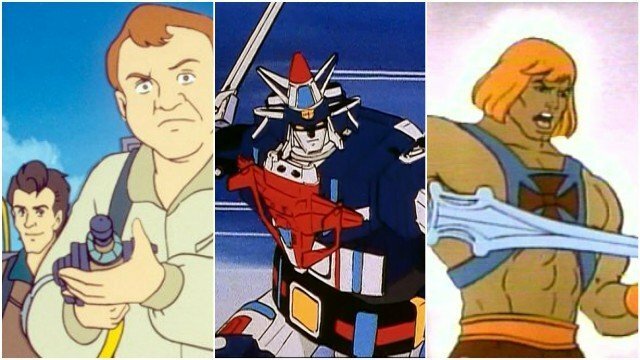 The post The 10 Best 80s Cartoons That Will Make You Nostalgic For Childhood appeared first on ComingSoon.net.